Abbey Seitz recently asked What If Interstate 94 Was a Park?. This is an excellent thought experiment. The history of I-94 is well-documented, Matt Reicher vividly described theBirth of a Metro Highway. My own version of the history is below. Between 1947 and 1950 vehicle registrations in the Twin Cities increased 58 percent. St. Paul officials realized that they needed to solve congestion and other transportation problems. Previously, city officials dealt with increased congestion by widening existing links. This option was becoming increasingly expensive as the city grew. Freeway plans were developed connecting downtown Minneapolis and downtown St. Paul, but it wasn’t until the Federal Aid Highway Act of 1956 was implemented that it became certain a freeway would be constructed. The Federal Aid Highway Act ensured there would be funds available (90 percent federal to be matched by 10 percent state). With the construction of some freeway ensured, the next step was to determine which route it should follow. St. Paul and state officials recommended that the route follow St. Anthony Avenue, a largely residential city street parallel to the busiest route between the two cities (University Avenue), which happened to run through a minority neighborhood (The Rondo). George Herrold, St. Paul’s Chief Planning Engineer until 1952, argued against the construction of a freeway along this route. He proposed a plan dubbed the “Northern Route” about a mile to the north of the St. Anthony Route. The Northern Route, because of its use of existing railroad right of way and industrial land, would not displace many residents or sever neighborhoods. In St. Paul, the St. Anthony Route divided the state capitol and government buildings from the central business district. Despite Herrold’s advice, St. Paul and state officials would not deviate from the proposed St. Anthony Route. With the St. Anthony route all but built, concerned residents began speak out. The St. Anthony Route would displace nearly one in seven of St. Paul’s African-American residents. African-American community leaders quickly concluded that it would be nearly impossible to divert the freeway, so they devised a list of actions they requested government officials to comply with: Help displaced residents find adequate housing, Provide proper compensation, Construct a depressed (below grade) freeway to enhance aesthetics. The displacement of the African-American community members was especially significant because there were few options available to them. At the time (the 1950s, before fair housing laws were enacted), most white communities would neither sell homes to them nor rent property to them. For this reason, officials feared that the African-American community would become over-crowded. In the end, only the second and third actions were followed through. The Prospect Park Neighborhood in Minneapolis was also severed by the St. Anthony alignment, and residents were worried the freeway would turn this diverse upper middle class neighborhood into a low income one. Residents claimed that having a low-class neighborhood within close proximity to the University of Minnesota would make the University unappealing to students and faculty. The community had one request: that the freeway be placed over an existing railroad spur; however, limited funding disallowed this idea. The freeway did however skirt the Malcolm E. Willey House designed by Frank Lloyd Wright. Despite the freeway separating the neighborhood from the Mississippi River, the neighborhood did not deteriorate. The freeway was completed in the late 1960s. Aesthetically, the I-94 freeway is a scar across the surface of the city, which in addition to having displaced residents, disconnected local streets, moved traffic from a relatively even distribution to a more hierarchical one, so that movement depends on fewer, now more critical links. While certainly more people are moving longer distances everyday on the urban freeway, congestion has far from disappeared. One can ask in retrospect whether building the road was the right thing, or whether building it there was the right thing, but there is no real “control” for this experiment. Asking whatifs are easy, answering them is harder. But no-one seriously is calling for the removal of this element of the Interstate system, suggesting the collective intuition of those who think about the road daily suggest that “sunk costs are sunk,” and while in retrospect not everything was done perfectly, leaving it in place is better than removing it. The question then, is, if we can’t live with it, and can’t live without it, can we make it better? From the point of view of drivers, creating a giant tunnel is unattractive, though this is clearly better for the neighbors. From the perspective of the community, it is also extremely expensive. Barney Frank once quipped about Boston’s Big Dig “Wouldn’t it be cheaper to raise the city than depress the artery?” Indeed it would have. The good fortune the Twin Cities has is that I-94 is already depressed (not to say depressing). Thus bridging over it is relatively straight-forward (not cheap or trivial, but nothing like Boston had to do). 3-D Urbanism, thinking about the city not just from a 2-Dimensional plan view, but in multiple dimensions, where each elevation does something different, would be progress. 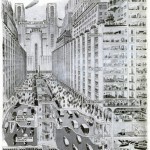 Early 20th century visions of the future thought about 3-dimensions, not just of buildings, but of travel. 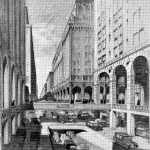 We seemed to have lost many of those visions in present-day urbanism, which proposes to tear down skyways and put people on the street with cars. We should think carefully about where cars and people mix, and where they don’t. If you are going to continue to have cars and cities, why must they mix with pedestrians and bicyclists. We seldom built such things as shown in the accompanying pictures, but we have opportunities to take advantage of 3-dimensions to benefit all travelers. First, it increases capacity per unit space. There is more density to the transportation infrastructure in these 3D rendering then our current flat-land. This is only worthwhile if density is high and crowding occurs. Second it increases pedestrian safety by eliminating pedestrian/vehicle conflicts. The solution I still like best is Air Rights / Land Bridges /Freeway Caps. Land is not so scarce in the Twin Cities that the market feels the need to go creating much new real estate over the freeway system. The examples we have in Minnesota were publicly financed (parking ramps and a stadium in Minneapolis, Parks in Duluth. However, if we did bridge over the freeway, in addition to creating more real estate to defray some of the cost, we also have potential spillovers raising the value of nearby land by some amount (i.e. some capturable value from both Air Rights and appreciation). How much more would you pay to be one block from a park or a freeway cap with some street frontage than one block from a freeway. This is quantifiable. Whether this is sufficient benefit to pay for the costs is an empirical question (for which I don’t have the answer, but know that it is possible). There are further benefits possible from noise reduction, better pollution control, and the like which are also quantifiable. As with anything, this has to be done somewhere before it can be done everywhere. Previous discussion suggested I-94/I-35W at Nicollet Avenue (rather than I-94 between Minneapolis and St. Paul) was a good place to start. So as part of the rebuild Nicollet discussion (ranging from the project downtown, to Streetcars, through K-Mart and Lake Street), let’s put a Freeway Cap into the mix. And of course, there is the Iron Law of the Twin Cities: if Minneapolis gets it, St. Paul wants it. The busiest street crossing I-94 in St. Paul is Snelling, which is complicated by a freeway interchange. But with new (walkable?) development nodes at Snelby and University, the A-line BRT, potential freeway BRT/HOT lanes on I-94, and a fix to Ayd Mill Road, Snelling could be reclaimed from its current state as a pedestrian hell with good design. Pedestrians will still presumably be crossing freeway entrance ramps (hence the site is not as easily implemented as Nicollet), but this need not be “at grade” pedestrians elevated above the fray in a skywalk carved out of buildings in an air rights configuration as someone might have dreamt of in an 1920s issue of Popular Science, or other creative designs can enhance safety, experience, and throughput. Instead of thinking of Midway as a Big Box Mecca, a plan running into the buzz-saw of modern shopping behavior, we should think about Midway City, a high density urban amalgamation with some of the highest transit and freeway (and eventually pedestrian) accessibility in the region, running from University to Selby along Snelling and from Snelling to Lexington along University and I-94.The area is as close to a blank slate now as it ever will be. Some imagination is in order. Brief History section adapted from Garrison, W and Levinson, D (2014) The Transportation Experience: Second Edition. Oxford University Press. And it’s not a new problem. There are two ways to remedy the deluge of traffic, Levinson said: Increase capacity or reduce the number of cars. He is one of a group of local transit enthusiasts who’ve come up with a variety of ideas for improving the bottleneck, from removing some freeway access to transforming the intersection into a roundabout. Levinson has suggested eliminating through traffic on Hennepin and transforming the space into a transit mall with space for pedestrians, bicyclists and a fixed mass-transit route. Even if those ideas were implemented someday — they’re not part of the project that will begin next year — it’s unlikely that Hennepin’s importance as a transit corridor would change. “It’s always going to be a bottleneck of some kind because it’s a critical intersection, and there’s a lot of people who want to get from downtown to Uptown,” Levinson said. I suppose they found me because of the streets.mn post: What if we closed Hennepin? I plan to “flip” my Introduction to Transportation Engineering Course, i.e. record my lectures and use class time for more interactive projects (like actually building a model). I am going to use the next few weeks of this blog to feature draft lectures (or lecture segments) from the course. The risk is the “lectures” without the interactivity that is normally there, are dryer. The advantage is, without the interactivity, they are much shorter. Further, students can review complicated bits, and can focus on watching rather than note-taking.